PATMOS the Jerusalem of the Aegean Sea is this island of aesthetic austerity. Patmos is mentioned in the Christian scriptural Book of Revelation. The boo's introduction states that its author, John, was on Patmos when he was given his visions of the Apocalypse. Christian tradition identifies this writer as possibly John the Apostle. Patmos is a destination for Christian pilgrimage. Visitors can see the cave where John is said to have received his Revelation, called the Cave of the Apocalypse, and several monasteries on the island are dedicated to Saint John. LAMBI also reached by excursion boat or a 9 kms hike from town, is famous for its subtle, multi-coloured pebble beach. MELOI is a pleasant tree-shaded beach at 2 kms distance from town and tends to get crowded; Patmos main beach resort. GRIKOS overlooks a beautiful bay.An idyllic fishing village,apprx. 5kms from the port Skala located at the fascinating bay of Grikos with its mysterious rock Kallikatsou. The old square offers a romantic view of colorful fishing boats and small tavernas offering traditional food at all times of the day. Secluded beaches with lots of shady trees and sun-beds with umbrellas in some parts, are the ideal place for a relaxing holiday. Water sports are offered for those who seek sportive pleasures.Grikos is connected with all parts of the island through regular bus transport and taxis or old paths leading to Chora and Skala. 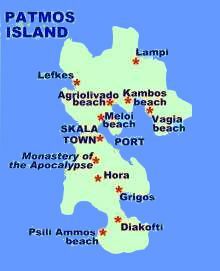 KAMBOS lies in the centre of the islands main agricultural valley and has a popular sandy beach. Its a rural village apprx. 4 kms from Skala, located at a beautiful sand bay with lovely white houses in the Seagean style. An unspoilt piece of nature, where fishermen and farmers are your next door neighbors. The village square as well as the beach offer a variety in good tavernas and a small grocery shop supplies you with whatever is needed. Shady trees and sun-beds on the beach give the visitor all the contort required and water-sports facilities are available for those who need some physical activity. Kambos is connected with Skala through regular bus transport and taxis and fishing-boats all day long.